The 2016 Election has certainly been frightening, so why not celebrate its end with a Halloween costume dedicated to your favorite (or scariest) candidate? While a Donald Trump costume may require an elaborate if still unbelievable toupee, it won't break the bank for you to dress up as your favorite Democrat. Luckily for you, there are several cheap Hillary Clinton Halloween costumes you can put together on a tight budget. With Halloween just a few weeks away, you probably don't have the time to make the pantsuit of your dreams. But worry not — these costumes will give you plenty of options to dress up as the highly qualified candidate Trump somehow likes to call the Devil herself. And yes, sadly, Trump actually called her this during the last presidential debate. For most of these, you'll just need a wig and DIY Halloween spirit. If you're dressing up in support of Clinton, she'll probably appreciate the effort, at least. What's more meta than Hillary being with Hillary, right? You'll just need a Clinton campaign shirt and a blonde wig for this one. No matter how the election turns out, you can go out and support yourself! Vote for yourself with this costume! You'll just need to cut out holes from a box for your arms, legs, and head, and decorate the box however you'd like. Collecting candy is almost better than collecting votes, right? Frankly, either of these options could help you pull off the Trump look. This costume is probably the easiest and cheapest, for those running short on time and cash. Just fasten a Clinton yard sign to your outfit using some fabric glue, and you'll be ready to go. And please make sure it's your own yard sign and not one you found across the street. This classic look from Clinton's historic "Women's Rights Are Human Rights Speech" would make for a great costume. You'll need a pink blazer and set of costume pearls. This blazer from Sears is a fairly inexpensive option. If you'd prefer to go the straight up creepy route, tons of retailers are selling your standard, rubbery Clinton mask likely imported from Hell. Here's one from Party City. And don't forget your American regalia! Assuming Election Day ends up with Trump imploding into a ball of fire, use Halloween to celebrate a little early! 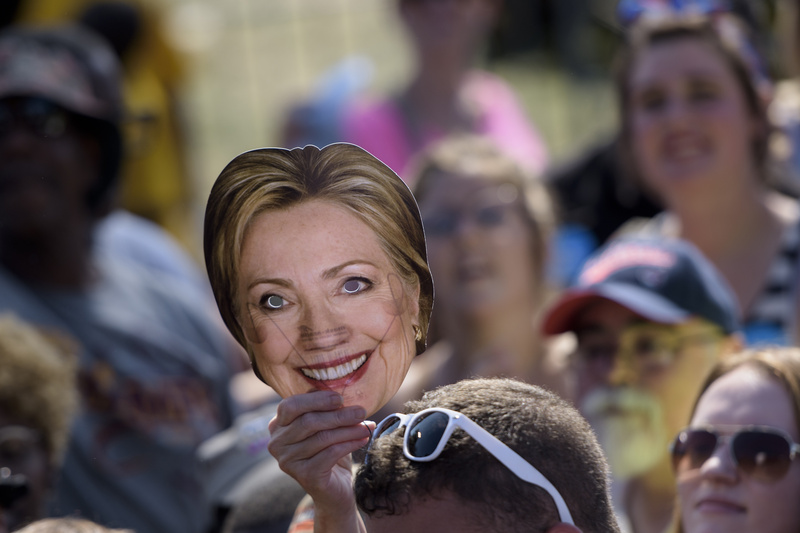 Use one of these Clinton costumes, with one addition: a giant crown on your head. Because let's face it, you've got this thing! Now go out there and get all the candy! Votes are acceptable too though, I guess.